This is the only kind, a very curious spiny desert shrub, about three feet high, varying a great deal in general appearance in different situations. The stems and foliage are gray-green and imperceptibly downy and the flowers are over three-quarters of an inch long, with a corolla which is hairy outside and has a lilac and white upper lip and a dark blue lower one. The calyxes become inflated and form very curious papery globes, over half an inch in diameter, very pale in color, tinged with yellow, pink, or lilac, and extremely conspicuous. In the desert around Needles, in California, the general form of the shrub is very loose and straggling, with slender twisting branches and small, pale gray-green leaves, both flowers and leaves very scanty and far apart, so that the bunches of bladder-like pods are exceedingly conspicuous. In the Mohave Desert it becomes a remarkably dense shrub, a mass of dry-looking, criss-cross, tangled branches, spiky twigs, and dull green leaves, speckled all over with the dark blue and white flowers and the twigs crowded with pods. Sometimes the flowers are magenta instead of blue, but are all alike on one bush. 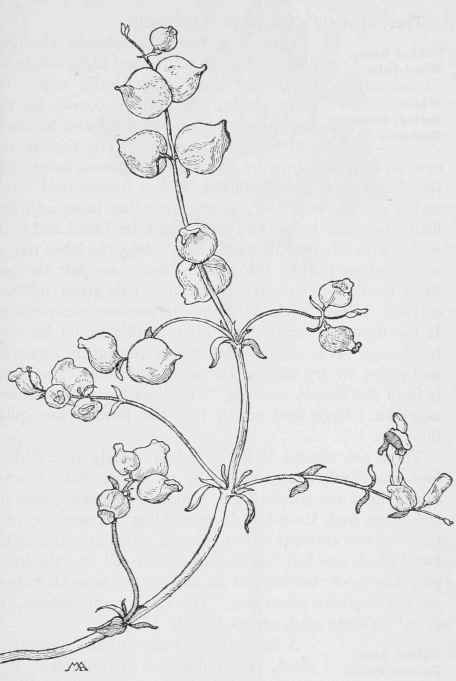 The stems are not square, as in most Mints. The drawing is of a plant at Needles. Bladder-bush - Salazaria Mexicana. MINT FAMILY. Labiatae. There are only a few kinds of Sphacele.